Designing and constructing a roadway network with a high degree of connectivity is an important, efficient strategy for accommodating increased traffic. Connectivity is defined as the measurement of a system of streets with multiple routes and connections serving the same origins and destinations. Simply stated, a high degree of connectivity means there are many ways to get from Point A to Point B. An inter-connected roadway network can accommodate more travel demand than a roadway network with limited connectivity. The traditional grid-style street layout provides excellent connectivity because streets are interlinked at numerous points, intersections are closely spaced, and there are few dead-ends. The presence of a grid pattern and alternate parallel streets allows the state highway and other major roads to serve their main purpose — moving vehicles over longer distances — while shorter trips can take place on local streets. However, suburban municipalities with individual, isolated cul-de-sac developments typically require access onto arterial streets, and often inhibit walking and bicycling by both adults and children. These suburban developments create congestion by overloading the limited number of intersections within the network. Typically, the best solution is to provide for a balance of increased connectivity with the opportunity for cul-de-sacs or dead-end streets where appropriate, and the use of traffic calming measures for reducing speeds and improving safety. Energy Conservation: More direct travel routes and faster travel can reduce fuel use, and pollution can be reduced because of faster travel times. Safety: Increased roadway connectivity can result in a safer system for vehicles, pedestrians, and bicyclists. Reduced Congestion: Decreased traffic on arterial streets can result from increased roadway connectivity. Travel Efficiency: More roadway connectivity can result in continuous and more direct routes. Better Emergency Service Response: Improved emergency vehicle access and faster response times can result if emergency vehicles have more access options. Encourages Walking and Biking: More roadway connectivity can result in increased opportunities for walking and biking, thus increasing physical activity, as well as more efficient transit and school bus transportation. Improved Vehicle Distribution: More roadway connectivity can result in better distribution of vehicular traffic across the system. Increased Utility Efficiency: More roadway connectivity can result in improved utility connections, easier maintenance, and more efficient trash collection. Increased Traffic on Residential Streets: More roadway connectivity can result in increased traffic on some residential streets. Cost: Providing more connections can result in increased local infrastructure costs and increased impervious cover. More Development Demand: More street interconnections and the associated increased access can result in increased demand for developable land. Increased Vehicle Speed: Less congestion can result in increased vehicle speeds. Local Opposition: Some residents prefer cul-de-sacs instead of connected streets and some are concerned about crime that can be associated with increased traffic volumes in residential areas. Street Connectivity: Improving the Function and Performance of Your Local Streets prepared by the Lehigh Valley Planning Commission in June 2011. 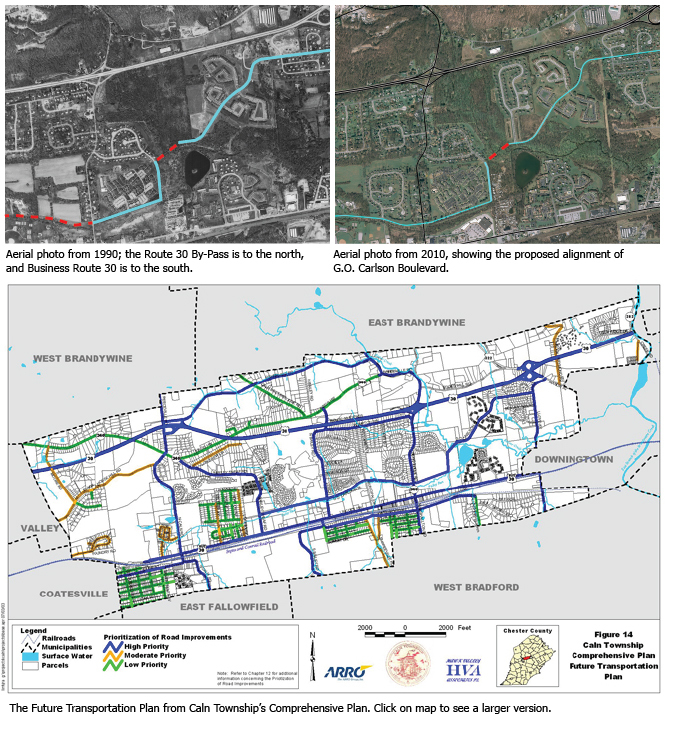 Both of these documents provide significant guidance for local municipalities by recommending various planning tools, measures and studies and provide case studies examining the pros and cons of development patterns in existing communities. G.O. Carlson Boulevard is planned to be an arterial collector street that runs parallel to the north and provides congestion relief from the heavily traveled Business Route 30. This roadway has been developed incrementally over time and will achieve full buildout with the completion of the final segment between Park Drive and Hidden Creek Drive. This continuous roadway is envisioned with the Future Transportation Plan element of the Caln Township's Comprehensive Plan. 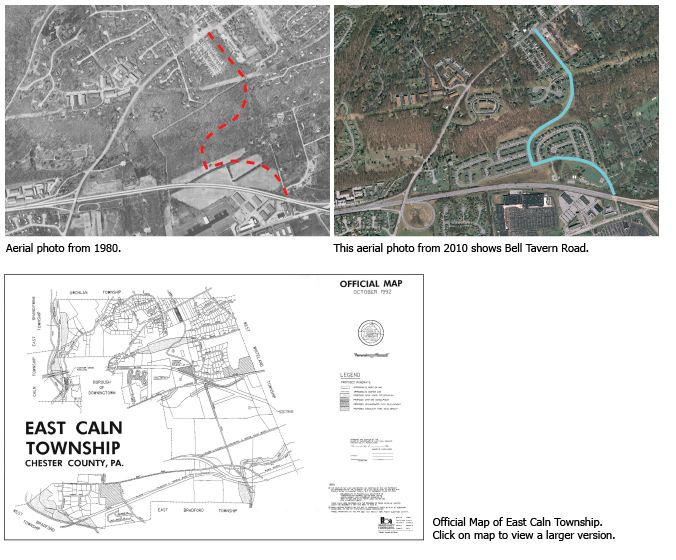 This example shows how East Caln Township officials utilized the Official Map for the development of Bell Tavern Road. 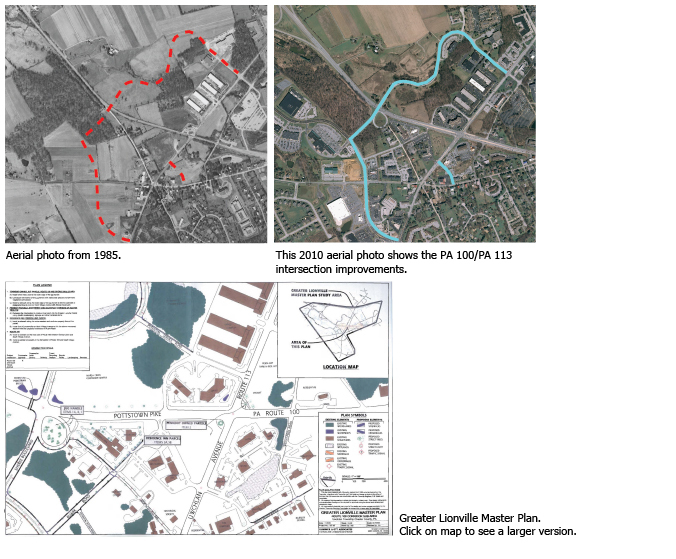 This example shows how various roadway connections were developed in the vicinity of the PA 100/PA 113 intersection as part of a Master Plan/Land Development Process. This example illustrates how Commerce Drive was developed to provide connectivity around the PA 100 and Business Route 30 intersection. Planning for Street Connectivity: Getting From Here to There, available from the American Planning Association. Roadway Connectivity: Creating More Connected Roadway and Pathway Networks, Victoria Transport Policy Institute.